Who really won the Congolese elections? The first is a partial tally of election results from the central database of the Independent National Electoral Commission (CENI), representing 86% of the total votes cast, which was leaked by a whistleblower. The second is a leak from the Catholic Church. The episcopal conference (CENCO), which represents all Congolese bishops, fielded 39,824 observers on election day. Their data represents 43% of ballots cast. The Catholic Church’s document can be accessed here, while the main CENI leak can be seen here (all of the results by polling site), with the raw data here, and a summary of the results here. The two documents, which were obtained independently, provide almost identical results, suggesting that Martin Fayulu won the elections by a large margin. The CENI leak puts his share of the vote at 59,42%, followed by Felix Tshisekedi with 18,97% and Emmanuel Ramazani Shadary with 18,54%. CENCO’s tallies were 62,80%, 15,00%, and 17,99%, respectively. The results contradict those published by the election commission on January 10th 2018, which proclaimed Felix Tshisekedi the winner with 38,57% of the vote, followed by Martin Fayulu with 34,8% and Emmanuel Ramazani Shadary with 23,8%. These two documents suggest that the elections were dramatically rigged in the favor of Felix Tshisekedi––the difference between his tally the official results and the leak is around 3,6 million votes. The Constitutional Court is currently considering a challenge to the results. If it confirms Tshisekedi’s victory, it will be extremely difficult to reverse the results. The results were provided to Radio France International, the Financial Times, and TV5 Monde, who collaborated with CRG in analyzing the data. How were the leaks obtained? The CENI leak was initially given to journalists in different ways. Some journalists received it from members of the opposition close to Martin Fayulu, who said they had obtained it with the help of a whistleblower. At least one journalist was able to make contact with the alleged source of the leak. The account provided by the whistleblower was credible. The documents from the Catholic Church were leaked to journalists from different sources within the organization. How do we know that the leaks reflect the real results of the elections? Comparison with CENCO data: The Catholic Church has said in public that the results announced by CENI on January 10th contradict their own findings, they have not made their figures public. We were able to obtain a leaked CENCO dataset representing a tally of 42% of the total vote, relatively evenly distributed across the country’s 26 provinces. The results are almost identical to the leaked CENI file, both at the national and the provincial level, with a correlation of 0.976 to 0.991 for each of the three leading candidates (1 representing a perfect match). At the national level, even though the Catholic Church had tallied less than half of the total votes, the differences between the respective candidates were less than 4%. In 22 provinces, the differences were less than 2%. In four of the provinces, there were some larger differences between tallies for the candidates: Tanganyika (+/-18%), South Kivu (+/-9%), Tshuapa (+/-5%), and Maniema (+/-4%). Comparing with election observers on the ground: The Catholic Church data did not provide information down to the level of the polling site (site de vote), which is how the CENI file reported the data. And most election observers reported the results at the local level by polling station (bureau de vote), of which there can be many in each polling site. However, by adding together data from polling stations, we were able to verify 15 of the polling sites, made up of over 200 polling stations, mostly in North Kivu. The data matched the CENI leak. How credible is the Catholic Church’s tally? CENCO ran the largest election monitoring mission in the country, supported by several foreign donors, and conducted a parallel vote tabulation. They fielded almost trained 40,000 observers, with at least one for each of the 21,784 voting centers. CENCO set up a call center staffed by 408 operators tasked to support the observers in the field. 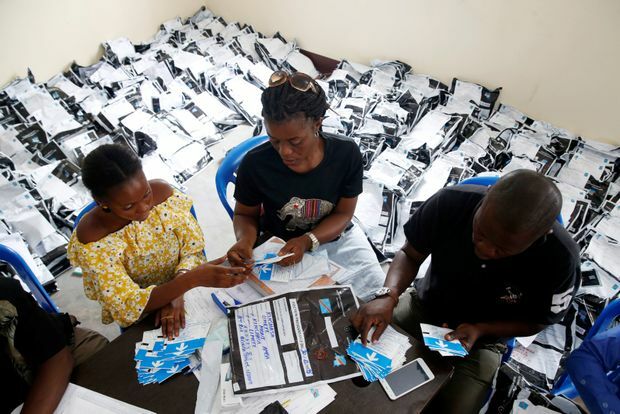 The election results were written down, with pictures taken of the results and transmitted in many cases, and sent to technicians in Kinshasa, who would analyze the data for coherence and input it into a central server. According to CENCO’s reporting, the electronic vote counts appeared to broadly conform with the manual tallies, although there were significant differences. CENCO collected at least three datasets. The first was a representative, random sample of 7,886 polling stations, 10,72% of the total. Since the church was not sure how quickly they would obtain data from all of the polling stations, and how comprehensive this data would be, they wanted to have a sample they could draw on early in the process. The results for this sample can be found here. They differ slightly from the tally of 43% of the vote, giving Fayulu a victory with 57,37% instead of 62,80%. Given that it was a stratified, representative sample, it is not surprising that it is more accurate than the 43% tally. CENCO then compiled data from their election monitors across the country, producing a tabulation after they had gathered 43%, cited above, and another after they had 72% of the vote. CRG spoke with sources who had seen this last tally, who said that Fayulu’s share of the vote remained broadly the same as in the previous CENCO count. Is it credible that CENI would have this kind of data and that it could be leaked? Yes. Article 69 of the CENI’s measures of applications of the electoral law calls for the results to be transmitted to the central CENI office by local technicians. It appears that this leak took place several days before the CENI announced its official results, as it only represents 86%, or around 15,7 million, of the 18,3 million votes cast. It is possible that the remaining results could not immediately be transmitted due to technical problems and had to be transmitted through other means. But couldn’t the Catholic Church have colluded in providing fake data to corroborate a leak of fake information by the opposition? Anything is possible. But that would have had to implicate the entire leadership of the Church’s observation mission, as well as other senior clergy. And it would have had to taken place without anyone finding out about the scheme. That scenario is extremely unlikely. Will these leaks lead to a review of the election results? It certainly should, and only a comprehensive audit can confirm whether there was indeed massive fraud. However, the election commission has thus far not published any disaggregated data beyond the national results. Only by releasing election data down to the level of the compilation centers (CLCRs) and polling stations will independent observers be able to assess the veracity of the results. In the meantime, the constitutional court is due to make a decision regarding Fayulu’s appeal of the results later this week. If it confirms Tshisekedi’s victory it is unlikely that there will be other legal recourse.